A proudly displayed plaque hangs at the Cape Coast Castle, one of Ghana’s most visited historical monuments, and states regarding the country’s involvement in the trans-Atlantic slave trade; “May humanity never again perpetrate such injustices against humanity. We, the living, vow to uphold this.” Little did I know that these words during my trip to Ghana would shape an ongoing project that examines Ghana’s social, economic, and environmental short falls that breed a perfect environment for forced child labor, one that needs to be exposed. At any given moment as tourists wander the halls of the castle believing slavery to be a thing of times past there are an estimated 193,000 working slaves in Ghana. One out of every four of these slaves are children as young as four years old who have been sold by their own families and trafficked from the northern agricultural regions under the guise of a better life. Once severed from their families, who believe they will return in a few years, the children are transported great distances from their hometowns to ensure they will never be seen or heard from again. Typically the parents sell their child for about $50 and the trafficker will then mark them up to a price of $300 for the end buyer. Making the forced labor and trafficking market a lucrative opportunity in a country where many struggle economically. These slaves are used in a variety of industries within Ghana from mining and fishing to cocoa farming and processing the world’s electronic waste. In areas like the Lake Volta region children are forced to participate in hazardous activities within the fishing industry such as diving to great depths to untangle caught fishing nets which often result in fatal consequences as logs can often pin the diving children underwater. 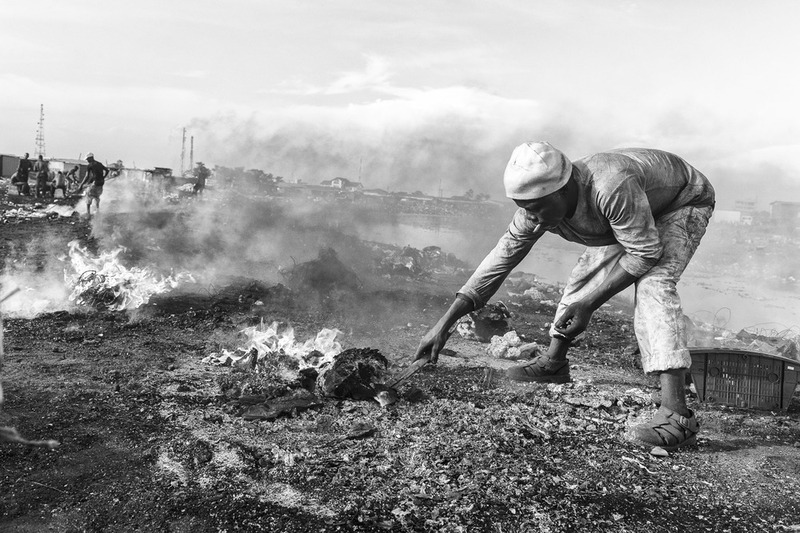 Similarly in an area outside of the capital of Accra, Agbogbloshie, an electronic waste dump demonstrates many of the threats these children face on a daily basis. My first hand account with a young man by the name Smalls created an all too real visual of the severity of this problem. As a result of the plumes of smoke from burning plastic and heavy metals Smalls, who suffers from reoccurring headaches and respiratory infection, told me that any money from the scraps of copper wiring he can find on the oil saturated floor of the waste yard usually gets spent on medication to treat his illnesses. With the country having ratified some critical legislation to restrict forced labor the country falls victim to not having enough resources to enforce the laws which makes them all but ignored. Working with new and existing contacts in local Ghanian children's organizations, this project is aimed at visually documenting both the efforts to abolish child slavery and the state of child slavery today. With this vision and experience I hope to open people's eyes and uphold the promises made by by Ghana’s leaders as they mounted that plaque for all to see at the Cape Coast Castle.